Oh look, hopes and prayers again. There, that'll solve it. Remember when Trump threatened Clinton with "second amendment people"? Well there ya go. Margate Fire Rescue had deemed the shooting a mass casualty incident. Police said a suspect is in custody. The suspect, who has not been named, is a male student and his social media activity indicates he is a member of “a number of gun groups,” according to Fox News. 18th school shooting of the year (45th day of the year). 17 confirmed dead. This is the 18th school shooting in 2018 so far. Multiple outlets have identified the shooter as 19-year-old Nick Cruz, a former student that may been identified a potential threat to fellow students in the past, according to one teacher. Last edited by kkozoriz; 14-02-2018 at 05:07 PM. Meanwhile, Trump's (& MrNazi's good friend Alex Jones did this just after the school shooting today. What Trump's "Thoughts and prayers" really mean. President Donald Trump’s newly unveiled budget would cut millions of dollars from the National Instant Criminal Background Check System, which gun dealers use to verify if someone is banned from buying a gun before selling it to them. The two programs are currently funded at $73 million. Trump’s budget proposal for the fiscal year that begins Oct. 1 would slash their funding to $61 million, which amounts to a 16 percent cut. After seeing this picture, I just realized again that today is Valentines Day. It is supposed to be a happy day of love and friendship. 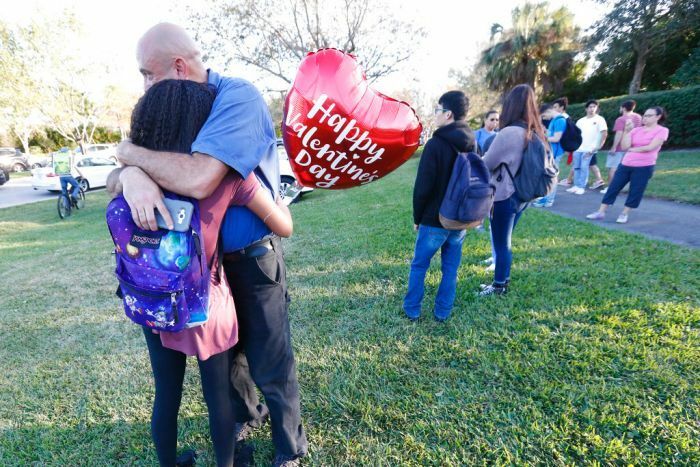 Today, many children will come home in coffins on this tragic Valentine's Day School Slaughter. Our hearts are filled with sorrow and openly wonder when the People will force the Government to change the lax gun laws laws and violent mentality that permeates the American society. They did not act after Aurora. They did not act after Sandy Hook. they did not act after Las Vegas. I highly doubt that Congress will act with a President who refuses to act like an adult. That shooter was expelled from school for causing lots of trouble. He was caught bringing bullets to school. He was reported to the FBI back in September for posting a YouTube video saying he was going to shoot up the school (his video was only taken down last night). He also allegedly has some ties to a violent white supremacist group. Is it really a shock that he followed through with shooting up this school? How many red flags did the authorities need to keep an eye on this deranged lunatic? No matter who or what, we all know nothing's going to change and no doubt gun sales will increase again. Hopeless. Yes, there will be a few days of politicians and others wringing their hands and saying how sad it is. Then some other news story will come up to take our attention away from this and nothing will be done. In a few weeks or months - repeat all this again. Its the American way. I know they do not spend a lot of the time thinking about what the rest of the world thinks about them, but this is one of the reasons many people around the world think the US is so silly. We don't all think of them being this great, successful country that they still imagine themselves to be, but rather a place to be dealt with carefully or avoided. Meanwhile, the Florida shooter is a Trump supporter who hates Muslims. Florida school shooter suspect Nicolas Cruz posed in a 'Make America Great Again' hat - the slogan made famous by US President Donald Trump. The 19-year-old also Googled "what does Allahu Akbar mean? ", liked to wear "extreme" patriotic shirts and "hated on Islam", according to reports. Student Ocean Parodie, 17, told The Daily Beast Cruz would mock Muslims as "terrorists and bombers". "I've seen him wear a Trump hat," she said. Heavy reports Cruz wore the "MAGA" cap in an Instagram profile picture verified to the 19-year-old which has now been taken down. In the picture, Cruz looks at the camera with almost all of his face covered by a scarf. The red hat is perched on his head with the Trump campaign's iconic words blazoned across the front. According to reports, Cruz also uploaded a screenshot of a 'what does allahu akbar mean' Google search to his Instagram. The picture was uploaded in 2015 with the caption: "Well at least we now know what it means when a sand durka says ‘allahu Akbar’ ??????" So, the "mentally ill" defense would seem to apply simply for being a Trump supporter. And from The Associated Press. It is sad state of affairs that school have to have 'active shooter' drills. ^The authorities have their hands tied. He had no criminal history. What do you expect to see the police to do, throw him into prison on suspicion that he might do something? The police can't even take his gun away. A Congressman told reporters that he regularly goes to buildings where you have to press a button while being watched on CCTV , to get into the first door. Then you have to do the same through the second door. Then you meet the security guard, show your ID, go through a metal detector, get a badge etc. etc. etc. This wacko Congressman was suggesting that they do this at schools. Right, 2000+ students who come in and out at different times, with multiple entrances, outdoor sports activities, and the simple fact that someone can jam a fire exit door and the shooter can enter at will. The cost of prison style security would cost hundreds of billions to install and billions more in security staffing yet most schools have not even enough money to pay their teachers or maintain the existing facilities. Let's blame the schools, let's blame the shooter, let's blame the authorities, let's blame mental health issues. Just don't blame the fact that a teenager can legally buy a military grade automatic weapon before he can buy a drink, and easier than getting a drivers licence. That doesn't sound like a "fact" at all. It has been about 130 days since the Las Vegas shooting where 58 people died. Wide bipartisan support to eliminate bump stocks. Such a narrowly defined issue that should be a pencil whip and unanimous vote to pass the legislation. On 4 October 2017 senator Dianne Feinstein introduced a bill to ban bump stocks. 130 days and counting no Congressional action had resulted. Yes, and they should have taken away his gun(s). But maybe that's what NRA and republicans have spend the last decades making it hard for law enforcement to do. Duty to inform? No, Florida law does not require one to disclose one's possession of a firearm on contact with Law Enforcement. Pass the written traffic laws and signs test. Those aren't the rules for buying a military grade automatic weapon, though. The threshold for legally obtaining those is MUCH higher than getting a driver's license. You don't need a permit or license to buy a gun, nor do you have to register a firearm. You don't need a permit to conceal carry a rifle or shotgun, although you do need it to conceal carry a handgun. You can buy as many guns as you want at one time, because Florida doesn't regulate that either. Gun sellers don't have to get a state license to sell firearms. And Florida does not regulate assault weapons, .50-caliber rifles and large capacity ammunition magazines. Assault weapons have gotten a lot of bad press lately, but they're manufactured for a reason: to take out today's modern super animals, such as the flying squirrel, and the electric eel. I also think it's ridiculous how easily an AR-15 can be purchased in the US, and how common they are. And the seemingly constant string of mass shootings is horrendous. But the statistical reality of both is that the majority of firearms deaths in the US are from handguns, and the cumulative total of mass shooting deaths is not much more than a rounding error of the overall death rate (whether just murders, or you also include suicides). Not to mention that mass shootings can easily be conducted with handguns, which are just as effective if not more so at close range and are more easily concealed. See Virginia Tech. But both make for easy headlines and receive an inordinate amount of attention. They're totems, in a way. Unless and until the US is willing to restrict handguns, they aren't going to make an appreciable difference in firearms deaths. And I see no sign of that any time soon, depressingly enough. Last edited by Marcel Petrin; 15-02-2018 at 01:33 PM. It’s now like the old dystopian Sci-fi movies where the newscaster in the background is announcing this or that mass casualty disaster as regular old boring news. Another one of Trump's "fine people". White nationalist leader Jordan Jereb told the Daily Beast that his organization — a separatist group that aims to create an all-white “ethnostate” in Florida — supplied Cruz with a gun, although he didn’t believe that it was the same gun used in the shooting on Wednesday. Jereb said he didn’t want to “glorify” Cruz’s actions, but he did say that the alleged shooter “was pretty efficient in what he did.” What’s more, he credited Cruz’s training with white supremacists for his efficiency in killing students. Last edited by kkozoriz; 15-02-2018 at 02:18 PM. "We'll put armed guards in the schools. That'll stop school shootings." An armed security guard never got the chance to stop the teen gunman who murdered 17 students and staffers at a Florida high school, authorities said Thursday. Broward County Sheriff Scott Israel confirmed that accused mass murderer Nikolas Cruz managed to shoot up the Parkland high school without ever encountering the school resource deputy. I saw a meme somewhere that the solution to all these school shootings is to hire unemployed veterans, arm them, and place them at schools. I thought it was a joke, but knowing who posted it, sadly it was not. The American solution to everything. 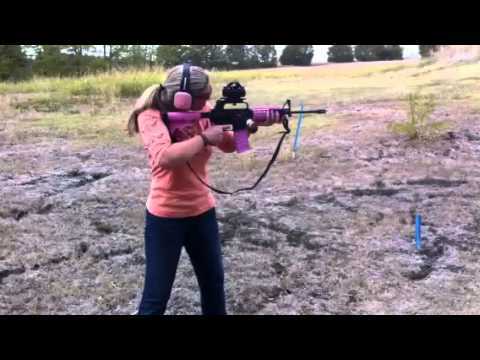 The AR-15 is only semi-automatic (not automatic) and it is NOT military-grade. And yes, there is a big difference between those distinctions. Nobody has called this shooter a fine person. I meant to say 'semi-automatic'. It is military grade with the only difference being the ability to fire in fully automatic mode. You can buy the parts to modify the AR-15 to fully automatic mode for under $200. A skilled gunsmith can modify the parts themselves. The Colt AR-15 is a lightweight, 5.56×45mm, magazine-fed, gas-operated semi-automatic rifle. It is a semi-automatic version of the United States military M16 rifle. Colt's Manufacturing Company currently uses the AR-15 trademark for its line of semi-automatic AR-15 rifles that are marketed to civilian and law-enforcement customers. Really, stop defending a gun that has been used in 6 of the worst 10 mass shooting in the US. Do you really think that the victims that were killed or injured care if the AR-15 is called a military grade weapon or a pretty pink version? Trump did not even mention the word "gun" let alone "gun control" in his speech today. It has been observed that there are two Donald Trumps: Twitter Trump and Early on Thursday, Twitter Trump came dangerously close to blaming the victims of the school shooting in Parkland, Florida. The president did not reply. no, there isn't "a big difference between those distinctions". at least not to alyssa alhadeff, scott beigel, martin duque, nicholas dworet, aaron feis, jamie guttenberg, chris hixon, luke hoyer, cara loughran, gina montalto, joaquin oliver, alaina petty, meadow pollack, helena ramsey, alex schachter, carmen schentrup, or peter wang. those are the 17 people who were killed by nikolas cruz's semi-automatic (not automatic) NOT military grade ar-15. for those 17 people and their families and friends and for many of the rest of us, you can take your technical "big difference between those distinctions" and put it somewhere very uncomfortable and leave it there. Yeah, full vs semi auto makes all the difference. [I]t was the killing power of the AR-15 that turned the heads of Pentagon bureaucrats and congressional appropriators alike. The battlefield testimonials included in the ARPA report are horrific: One describes an Army Ranger killing a Viet Cong soldier at about 15 meters with a three-round burst. "One round in the head – took it completely off," it reads. "Another in the right arm, took it completely off, too. One round hit him in the right side, causing a hole about five inches in diameter." Each shot was a killer: "Any one of the three would have caused death." Yes, there is. A measurable, provable, objective difference. It is incredible how badly the authority figures on the local, State and Federal levels failed to address the obvious and proven issues surrounding this shooter. And I think, before screaming about changing laws and Amendments to the Constitution of the United States, the USA needs to first ensure that the laws and processes they do have in place are actually followed. This whole story is an example of a MASSIVE institutional failure on the part of almost all levels of society and was easily avoidable, had people done their jobs. It's an even worse a failure than the shooting in Texas a few months back. I agree. Time to pass reasonable Federal gun controls that keep semi-automatic weapons out of the hands of the public. Maybe they should pass some Canadian type gun laws. what's the measurable, probable, objective difference to alyssa alhadeff, scott beigel, martin duque, nicholas dworet, aaron feis, jamie guttenberg, chris hixon, luke hoyer, cara loughran, gina montalto, joaquin oliver, alaina petty, meadow pollack, helena ramsey, alex schachter, carmen schentrup, or peter wang? and how would you propose to communicate that to them now that they're dead? Video recordings of the shootings reveal that the shooter fired as many as 22 rounds in 10 seconds. Expect a defective answer from MrAltReich. Last edited by Edmonton PRT; 15-02-2018 at 06:54 PM. For record keeping, these posts were moved from the catch all Trump thread. Interesting how this got moved to it's own thread with no mention of Trump after it came out the shooter was a fan and wore a MAGA hat. Very interesting indeed. I noticed that they are not "Mexican rapists or murderers" and a Muslim "travel ban" would have done nothing. Oh boy. The liberal indoctrination is strong in this forum. Last edited by ThrowAway; 15-02-2018 at 10:45 PM. 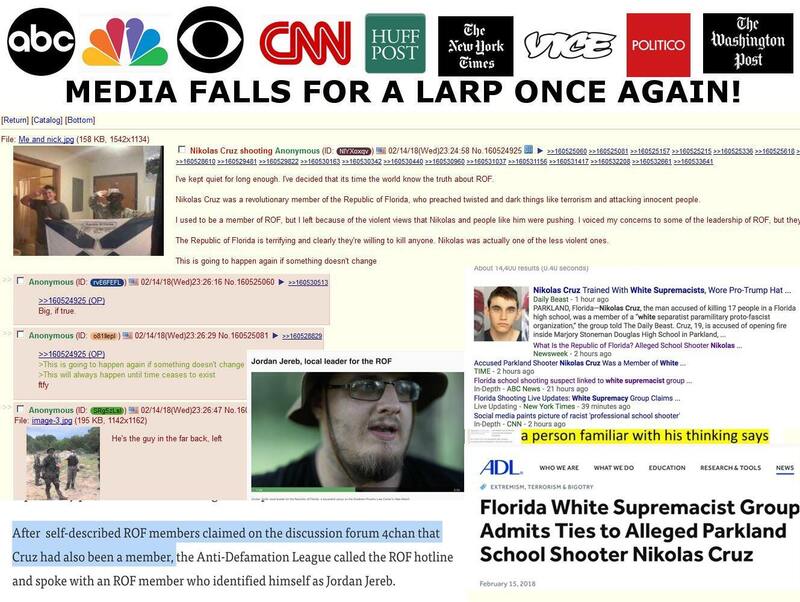 So the mainstream news is cherry-picking sensationalist stories from 4Chan to use as their sources? Unreal. No wonder their credibility is in tatters. Feel free to look up the difference between automatic and semi-automatic guns yourself and you'll find the measurable objective differences between them. How do you do you propose that, when the public already has millions of semi-automatic guns? The horse has left the barn. Is it massive institutional failure? He was mentally ill and the authorities knew about it but is it like taking away the individual’s right to have a gun, you can’t take away other individual rights either? So their hands were tied all around. So according to their constitutional rights, can we assume that they can not do anything about their gun problem? So according to their constitutional rights, can we assume that they can not do anything about their violent mental issues problem? Last edited by KC; 16-02-2018 at 07:44 AM. What's interesting is that you're ridiculously trying to correlate some Trump, or anti-Trump agenda to what is actually a thread move to talk about a very important issue and not have it buried in a 41+ page catch all thread. All I can say is how dare you even make this insinuation. Tanks. Going to need lots of tanks for enforcement and removal of firearms. It's not like there's no precedent for a developed, western nation revamping their gun laws & largely removing access to semi- & fully-automatics after a tragedy. Americans simply don't have the will or desire. Maybe they could actually do something. Australia did. They too are a gun loving country but constructive action resulted in a reasonable and effective gun policy. In April 1996, a 28-year-old man armed with semi-automatic rifles entered a cafe in the small Australian town of Port Arthur, shot and killed 35 people and injured 23 others. It was the worst mass shooting in Australian history. 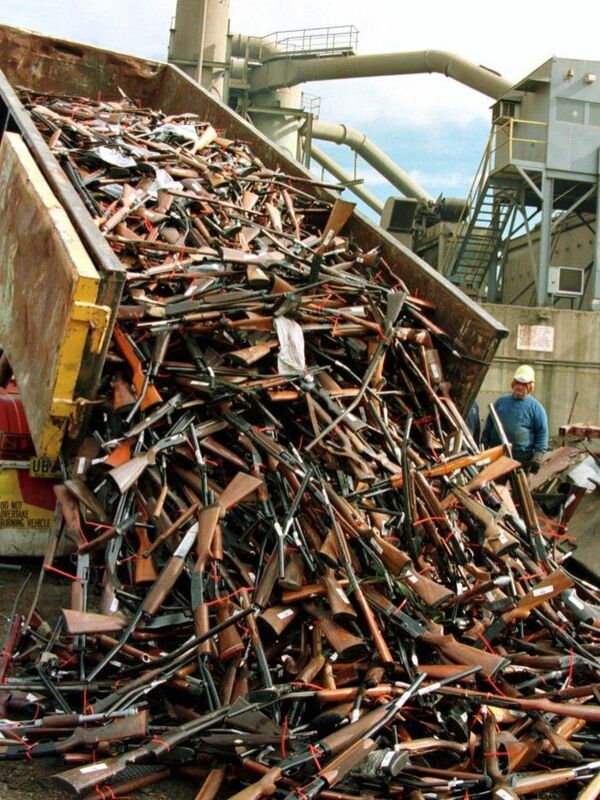 The day after the massacre, the country’s prime minister, John Howard (a newly elected leader), started to put together the most sweeping gun control reforms ever contemplated by any Australian government. The country passed the National Firearms Agreement, which banned automatic, semi-automatic and pump-action shotguns. It also introduced a stricter system for licensing and owning guns. The agreement is considered one of the strictest gun laws in the world. A nationwide gun buyback scheme also saw more than 640,000 weapons turned in to authorities. The guns were collected and destroyed. It took just 14 days after the Port Arthur massacre for gun laws to be proposed and then passed by the Australian government. In the decades before the Port Arthur killings, there were 13 mass shootings in Australia (defined by academics as the killing of five or more people, not including the shooter). This is not to say gun violence has been eliminated. In December 2014, an armed gunman entered a Sydney cafe during the morning rush hour and took a group of people hostage. Two people were killed, and four were injured during the attack. But since the National Firearms Agreement was passed the level of gun violence has decreased, according to numerous studies. In 1996, Australia had 311 homicides, of which 98 were with guns. In 2014, with the population up from about 18 million to 23 million, Australia had 238 homicides, of which 35 were with guns, according to Reuters. “Total homicide rates followed the same pattern. Removing large numbers of rapid-firing firearms from civilians may be an effective way of reducing mass shootings, firearm homicides and firearm suicides,” the study stated. Doing nothing but saying 'hopes and prayers' does NOTHING! Last edited by Edmonton PRT; 16-02-2018 at 08:47 AM. aaah... i see. instead of asking you something about one of your statements i should just remember instead that google is my friend? except the question wasn’t what the technical difference is. the question was what difference does that difference make to dead people? and the follow up question was how you would propose to communicate that difference to those dead people so they too have an appreciation for the difference? should i google how to talk to dead people? and if google has an answer you’re unwilling to share, does that somehow make them less dead? is that the message you would like to share with alyssa alhadeff, scott beigel, martin duque, nicholas dworet, aaron feis, jamie guttenberg, chris hixon, luke hoyer, cara loughran, gina montalto, joaquin oliver, alaina petty, meadow pollack, helena ramsey, alex schachter, carmen schentrup, or peter wang? In 6 or 7 minutes, the shooter fired 150 rounds. Up to 22 rounds in one 10 second burst. It’s like the never ending arguments about people being racists/religious’ists. While kk here wouldn’t fall into that category kk is trying to use the same discriminatory tactics to go after a group and a leader he dislikes. So take the example of a crazy murderer happening to be openly and outwardly Islamic. There are people that will go to extreme lengths to point out that religious connection and tie it go acts of violence in order to one, characterize all others under the Islamic umbrella as potential threats and two, that we have to fear all such people because the religious ideologies and it leaders encourage acts of violence. That one will follow the other. I’d say that kk is showing the same tendencies. Just think back to any number of acts of violence and the immediate and aggressive attempts to push the agenda that there has to be an Islamic connection. With the added punch that anyone doing do is a “racist”. (In the 1960”s I’d guess that it was communism and the Soviet Union that were the ‘go to’ enemies of the day. I also guess that by today’s broad use of the word, those unsubstantiated connections also reflected ’racist’ tendencies.) Now here it’s Trump and the right that such people are taking aim at in order to engage in character assassination. Last edited by KC; 16-02-2018 at 09:16 AM. I don't think that Admin had any agenda. It was simply practical to separate this issue to its own thread as it will certainly become a multipage thread on an important issue in the US where 93 people a day are killed by guns and many more injured or affected by such tragedies. There's a difference between someone being Islamic, i..e. a broad group, and someone who openly support a particular leader and their ideology. You'll remember how the White House, Sean Spicer at that time, said that they shooter in the Quebec City mosque was a Muslim. When it came out that he was actually a white, Christian supporter of Donald Trump, suddenly all we got from them was crickets. It's the difference between someone supporting ISIS and someone who is simply a Muslim. The shooting is Las Vegas wasn't spun off into it's own thread. Nor were any of the other mass shootings (Take your pick, there's been lots discussed). There may not be an agenda but I find it interesting that this one was apparently different enough to warrant it's own thread just after the shooters support of Trump came out. For that matter, the murder of a counter protester in Charlottesville didn't get one of it's own either. Just wondering what the criteris used was that required this one to be spun off. ^There is a 'Anti Trump Progressive opens fire at Republican baseball practice' and a 'US selling weapons abroad and US domestic gun control' for example under US Politics. I see no nefarious intent. What I do notice is the reaction, or lack thereof, by Trump and the Republicans of a mass child killer who is white male American citizen, Republican Trump supporter. Can you imagine what the reaction would be if the shooting was done by Democrat Mexican Muslim terrorist who illegally walked across the border and had voted for Hillary in 2016? Last edited by Edmonton PRT; 16-02-2018 at 10:44 AM. i think the difference between charlottesville and parkland was that the discussion surrounding charlottesville focused on trump's responses and the responses of his supporters regarding the involvement of who they considered very fine and good people in the demonstrationg that led to the death of heather heyer. the parkland discussions are focusing on responses and causes and - hopefully - courses of preventative action for events of which parkland is only the most recent and that extend well back of the current presidency. there was a single incident of this in the us in the 18th century, 28 in the 19th century, 227 in the 20th century and 208 in the first 17 years and 45 days of the 21st century (a period pretty close to a 50/50 split between democrats and republicans in the white house, senate and congress). as much as trump may not be the solution, he's not the problem and i agree with administration that the problem warrants its own thread. He may not be THE problem but he's part of the problem. His silence when his supporters carry out acts of violence speaks volumes. If the shooter is black or Muslim or another immigrant, then it's Tweetstorm after Tweetstorm. When it's a white shooter that does so, then it's "lone wolf" and "mental health issues". He's not the only one that uses those excuses for white shooters but he's the one that leads the calls when the shooter isn't white. OK, I won't belittle your intelligence by qualifying with "it may be rude", because I am about to be, and I make NO apologies. You, and many other people on this forum, need to take your politics poisoned partisan brains and give them a huge shake. Seriously. Use that orb on a toothpick between your ears for more than a hat rack and a conspiracy generator. This was split out because, after 18 school shootings this year alone, I simply felt this needed it's own thread instead of allowing it to continue to be buried in the rhetoric and ranting that is all things Trump. This is more than Trump. I was working in Littleton at the time of the Columbine shootings, and the conversation was the same. I worked at the Houston Independent School District just after, and it was a conversation then. Gun control was a conversation under Ford, Carter, Regan, Bush, Clinton, Bush, Obama, and now Trump. This is definitely not about Trump. Now, for you to accuse me of some partisan poppycock just shows that rhetoric is going to " Trump" reason. I think many of you need to go on a Trump cleanse. Maybe Trumpaholics Anonymous. Every conversation is not about Trump. Every move here is not about Trump, and in fact, is never about Trump. C2E has no influence on Trump, the Trump Administration, the Senate, House of Representatives, lobby groups, or the US in general. There is nothing for this forum, or me, to gain by making this conspiracy as you allege. What do you think? A small Canadian forum with zero influence is trying to protect a President and one of the most powerful lobby groups in the world? They need our support to keep pushing their agenda? You think I have the hubris to even contemplate this conversation, or the splitting out of one, makes a difference in a battle going back to the Second Amendment of another country's constitution? Like I said, I moved this one to not allow this conversation to yet again get buried. There is no other reason than that. Yes, I am angry. You don't want me to insult your intelligence, don't insult mine. I think many of you need to go on a Trump cleanse. Trump cleanse and an enema would get rid of the Trump Derangement Syndrome suffered by some of the more liberal posters on this forum. As for gun control in the U S A. Political hot potato. Dems or Republicans speak of changes but non of them have the political will to do anything about it. Guns are entrenched in to many American's lives. There are millions of gun owners in America that are sensible about their weapons and they feel it is their right to have them. Take away that right and they will be rioting in the streets. It's would take generations to change that attitude. Last edited by Gemini; 16-02-2018 at 03:52 PM. Seems to me Barack Obama did not renew the moratorium on automatic military style weapons when it expired so these mass shootings are his fault I guess. The original rule was hotly contested by gun rights advocates who said it infringed on Americans’ Second Amendment rights. Last edited by KC; 16-02-2018 at 01:47 PM. If it's being split out because it's about the 18 (and soon to be 19 the way things are going) school shootings, maybe the topic should be changed to simply cover all school and/or mass shootings instead of just this one. Or just an American violence thread. However the State of the World.... thread likely contains similar stuff. How long before someone tells the survivors that "now is not the time to discuss gun control"? “I’ve never been to a school after a shooting like this where I’ve met so many students talking about issues of guns when so many politicians are saying now is not the time to talk about the it,” host Cooper began. “Do you think change is possible in terms of the kind of change you want?” the CNN host asked. “There is a segment of this society that will shrug this off and send their thoughts and prayers but march for hours over a rainbow wedding cake” he added. 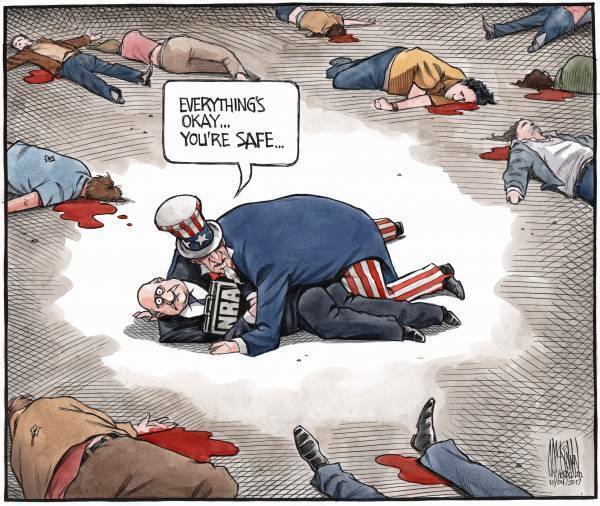 “A 2016 Harvard Business School study of responses to mass shootings throughout the US found that on average, in the year after a mass shooting in a Republican-controlled state, the number of enacted laws that loosened gun restrictions increased by 75 per cent. The researchers found that after mass shootings in Democrat-controlled states, there tended to be no significant increase in laws being successfully passed to tighten gun control. Last edited by KC; 16-02-2018 at 01:57 PM. Last edited by Drumbones; 16-02-2018 at 02:23 PM. The FBI gets literally thousands of tips like this. There's no way that they can follow up on every one of them. When you've got so many guns available, even belonging to teens as well as their parents, unless the FBI is going to be accessing Facebook, Instagram and Twitter 24/7, it's an impossible job. A survivor wants to talk to the president. Will he tell her it's too soon? In the aftermath of the Valentine’s Day massacre, Chad called Trump a “f*cking [piece] of sh*t” in a tweet that soon went viral. Take advantage of some of the weakest gun laws in the country for the low cost of $13. You don’t need a license or registration to own a gun. Assault weapons are unregulated. For rifles and shotguns, you do not need a permit to conceal carry (though handguns do require it). You can buy as many guns at one time as you want. A gun seller in Florida needs no license to sell guns in the state. An individual has to be 21 years of age to purchase a handgun, but only 18 years old to purchase an AR-15, as was the case with the Parkland shooter. In Florida, it is easier to buy a gun than it is to vote. Florida also has a massive loophole for weapons bought at gun shows, like the one in Miami this weekend: At gun shows, like most other online or private gun sales, criminal background checks are not required. There have been a few school shootings (in addition to their many other homicides) in the USA so far this year , but there hasn't been anything close to 18 of them. That "18 school shootings" is a myth that CNN claimed. Would you like them to arrest someone because they are suspicious? Oh wait, of course you would. But the reality is you can't and shouldn't arrest people for what they think, what they say (excluding hate speech, inciting riots etc. ), and so the way you can deal with these people is very limited. Do you expect the FBI to tail everyone who's a threat? There are 1.8 million people on the US Terrorist Screening Database, how can they possibly keep an eye on all of them? There's plenty of preventative measures that can be done, improving mental healthcare, improving education, but the most immediate one has to do with controlling who has access to guns, and screening people like this before they can buy them. If guns in the US were treated as a privilege instead of a right, it would greatly reduce this issue. A background check for an AR-15 mostly just involves checking to see if the person is buying it has a criminal record. No mental health evaluation, no looking at the groups and actions they have been a part of if they aren't illegal. If owning a gun was a privilege, it would be easy to reject an application because of concerns over his actions and motivations. As it was, there was no checks in place to stop this guy from getting an AR-15 (completely legally). I cannot see it being changed to 'the privilege of the People to keep and bear arms shall not be infringed'. There would be an uprising. Yes, they have a an army, airforce and navy. They have a National Guard. Many laws are updated as social mores change, so how come the U.S. has dragged its azz on this one for all this time? I guess they just 'lurve dem guns'. Bloody morons. It's time Canada took a stronger stand against illegal firearms entering the country. Right now, most people simply face a fine, usually in the $1,500 to $2,000 range. That should be boosted at least 10 fold as well as a minimum of a year in jail per undeclared weapon. If you're caught smuggling guns, not simply forgetting to declaring it but having it actively hidden, then the penalty should be in the 5 year range. Put big signs on the American side of the border warning them of the prohibition and what the penalties are. You get caught at the border, it's guaranteed jail time. Five men — three from Florida, two from New England — pleaded guilty and were fined between $1,500 and $2,000, he said. Thorn, who has prosecuted these cases for years, said most of the people caught are "respectful and law abiding citizens of the U.S.A." who are unaware handguns are either restricted or prohibited in Canada. Sorry, yeah I'm aware that it's a right in the US, which is what makes gun control so problematic. If it's a right there's very few ways to justifiably infringe on that right. IMO that part of the constitution is locked in another time and doesn't make sense anymore. The purpose is so they can rise up against the government if needed, which made sense when the most powerful weapons were muskets and cannons. But now there's drones, fighters, tanks, missiles, nukes. The whole population armed with rifles isn't gonna do **** against any part of the US army. The US border policy is that any person ever convicted of a marijuana offense (even possession) can be prevented from crossing the border for their lifetime. Perhaps any US Citizen that has registered fire arms should be prevented (for life) from entering Canada. Any way to make that happen? Would be an interesting move in response to America's over zealous border stance. 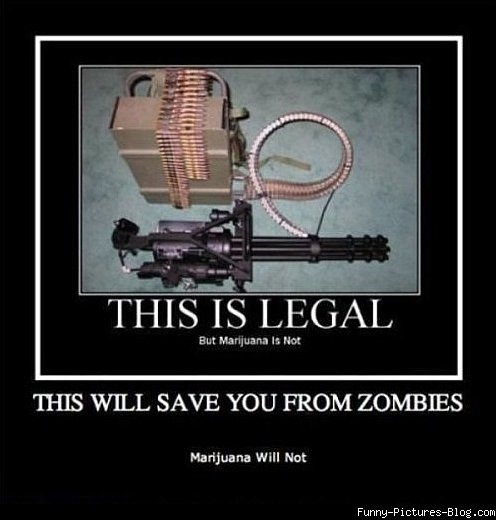 I mean which is worse, possession of marijuana or firearms? From a shooting in January. So many of these you never hear about because hte body count is so low it doesn't make the national news. And for comparison, here's a list of the mass shootings that have occurred this year. According to data from the Gun Violence Archive, a total of 30 mass shooting incidents have occurred as of February 14, including Wednesday's school shooting in Florida. Another thing about guns in the states is that there are millions of people who own them that are sensible owners. They own guns but keep them locked up. It's the crazy ones that get all the publicity for doing the awful things they do. The U S A amendment on gun laws is out of step with the times but it's so entrenched it's almost like second nature. Some societies who do not have the right to bear arms seem to function fine without this amendment. Canada does and lots of European countries. The sates just has not got the memo on that yet. Even if they do have stricter gun laws people who are hell bend on causing mayhem will just find another way. Unfortunately the internet is a wealth of information on how to make all kinds of bombs etc. Restrict access to guns and it still could be carnage of a different kind. I doubt very much the U S would supply any country with a data base of who owns registered fire arms in their country. Even if they did why would Canada punish someone with guns if they have not committed a crime with them. On another note, if that were enacted Americans who were thinking of coming here on holiday would just spend their money elsewhere. It would be 'to bad, so sad, we can't go to Canada' then they would just look at the map and go elsewhere. Just as with vehicle designs and roads, vehicles and their drivers have killed a lot of innocent people but technology has slowly been rolled out to reduce the hazard. So there may be partial technological solutions but any that have suggested for use in the guns themselves have been stopped in their tracks. I was posting that somewhat tongue and cheek. I do however consider possession of firearms as much more egregious than possession of marijuana and you couldn't pay me enough to live in the United States of NRA. Last edited by Replacement; 16-02-2018 at 06:58 PM. The problem is that cars are designed for transportation. Guns are designed to kill. When they are used properly, as designed, people die. I was posting that somewhat tongue and cheek. I do however consider possession of firearms as more egregious than possession of marijuana and you couldn't pay me enough to live in the United States of NRA. Oh I see, tongue in cheek. I think 95% of U S citizens are pretty decent people. It's the 5% loonies that let the country down. Their gun culture is the pits but most of them who own guns never have to use them. Changing their culture is another thing. Even the sane ones will not go for it. I think their attitude is if one of their rights is taking away what one will they go after next. I can understand that. As for living there, well I'd much rather be in Canada to. U S nice place to visit but would not want to live there as the sayin goes. Seeing as each state has their own regulations and many do not require any sort of training or licensing, we'd be well within our rights to ban ALL Americans bringing in firearms of any sort. You want to bring in a gun? First, you have to qualify as if you were a Canadian. You want to use a gun in Canada, you have to measure up to our standards. So on average each person is dealing with 50-60 tips EVERY DAY! In my view that’s I ncredible, and I’d say it must be impossible to do anything like that kind of job with any degree of thoroughness. Again with rough averages I figure each staff would have to be making a determination on each one in around 10 minutes. “In 2016, the FBI received about 1,300 tips a day through its website, which is staffed around the clock by two dozen people. Last edited by KC; 16-02-2018 at 07:25 PM. any gun being brought in to canada by an american (a) has to be licensed and registered to that person and (b) cannot be a “prohibited weapon” under canadian law and (c) must be transported in accordance with canadian restrictions (ie no open carry of handguns etc.). ‘When used properly’. Hmm. That’s maybe hand guns and semi-automatics but not hunting rifles and shotguns which are designed to kill animals. Nonetheless a vehicle could kill a lot of people. I wonder how many of the 3k tips/day are exactly citing a shooter saying they are going to shootup a school. Wouldn't such a public uttered threat online, that was reported jump right off the page. In anycase this was grossly mishandled starting from the school. If you are releasing a memo to all teachers and staff that this ex student is not allowed in with a backpack its quite obvious they had much more intel on this and knew exactly the risks. At which point this ought to have been serially reported to any law enforcement and requiring action. Theres 3,200 kids in this school. How is that not a priority for FBI or other law enforcement agencies? At the very least authorities could have interviewed the adults in custody of the 19yr old and would have obtained more insight right from that about him having access to a firearm that he owned. It does boggle my mind in anycase that an unstable 19yr old that had just lost his mother, that was distraught, and had previously had repeated mental health problems was granted a key to the fire arm cabinet lock. What sensible person would allow that and for what reason? Further there are consultants that work directly with schools that have experienced threats and that can recommend courses of action as well as having contacts with appropriate channels and stressing the risks to law enforcement so that they take more action. I don't know if the school obtained the utmost expertise in dealing with this. It is clear they recruited additional security. Finally, one thing that SHOULD minimally come from this is memo's released to all parents if ANY such threat has been uttered in relation to the school. So that parents could act accordingly as they see fit. Should parents and students NOT have the right to know? Should practicing "shooter drills' be the only information they have? edit; Just saw on the News that the FBI had received 20 different reports of concern about Cruz and including the threats that he was going to shoot up a school. Last edited by Replacement; 16-02-2018 at 08:04 PM. Point being that the uttering of the threat was already a crime. Just damned well enforce it and with immediate responses to protect the public. Such cases should receive court priority. Somebody makes a threat to shoot up a school and the automatic response should be warrant-arrest-incarceration-court-sentencing. 17 kids would be alive today. Last edited by Replacement; 16-02-2018 at 07:47 PM. How can a firearm be licensed and registered to someone if their state doesn't require it? Zero tolerance is the best way to handle it. If you feel unsafe without your guns, stay home or leave them behind. It's up to you. If you arrive at the border crossing station and you have a gun, it's a time for a big fine and mandatory jail time. Yes, when used properly, guns kill. And it doesn't matter if it's used against a human being or an animal. Unless you know of a way to guarantee that a gun that's designed for hunting cannot be used against people. The Parliament Hill shooter used a hunting rifle. No American citizen should be allowed to carry a firearm into Canada for any purpose. ANY. Change the Canadian laws so that any firearm is confiscated and destroyed at the border and that the owner is fined significantly. Any repeated instance being incarceration and or person forbidden from ever entering Canada again. Time to get serious with this. America can be gun crazy as much as it wants. Its imperative that other Nations impose their own standards in their own countries and that travelling Americans are made subject to that. Why shouldn't they be? This is the only way to send a message to the US that other countries do not agree with their gun laws. Last edited by Replacement; 16-02-2018 at 08:12 PM.